Love Can Turn The World includes live performances from a SOLD OUT concert in Johannesburg South Africa featuring Bill & Gloria Gaither and over 40 of your favourite Homecoming friends on-stage. Also includes last video appearance of the late Anthony Burger with tribute by Bill Gaither. 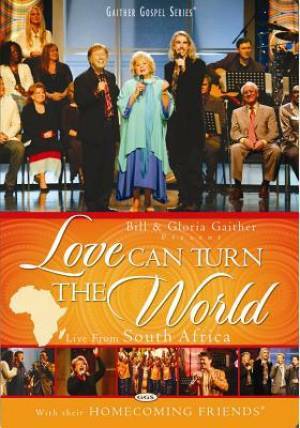 Love Can Turn The World DVD by Bill & Gloria Gaither & Their Homecoming Friends was published by EMI in July 2018 and is our 22377th best seller. The ISBN for Love Can Turn The World DVD is 0617884474096. Be the first to review Love Can Turn The World DVD! Got a question? No problem! Just click here to ask us about Love Can Turn The World DVD.